The conventional wisdom in Egypt examines the issue of intellectual property solely as a question of policing and enforcement. The high levels of protection indicated by the WTO Agreement on Trade Related Aspects of Intellectual Property Rights are unquestioningly assumed to be desirable. Policy debates—and all too often academic ones as well—focus only on the questions of how to more efficiently tighten IP protection and crack down on "piracy." Yet a more critical examination is urgently needed, whereby IP law, policy, and practice are viewed from a development perspective, rather than from an enforcement perspective. This volume takes on this endeavor. 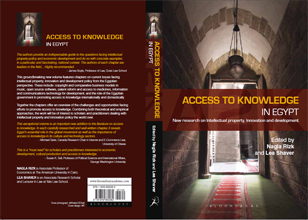 It offers the first examination of IP issues in Egypt adopting a multidisciplinary bottom-up approach that aims at maximizing access and contribution to knowledge, and in turn, promoting development. Bringing rigorous empirical research to bear on unquestioned ideologies, the collaborating authors question the conventional wisdom that more IP protection is necessarily better for innovation and development. The Software Industry In Egypt: What Role For Open Source? Foreword: Jack Balkin, Director, Information Society Project, Yale Law School.